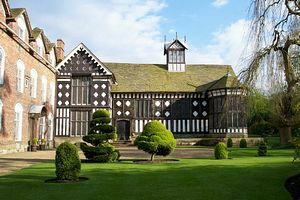 The magnificent Great Hall dates from around 1530 and is believed to have played host to a performing William Shakespeare. A magnificent, giant, carved, moveable wooden screen is thought to be the only surviving example of its kind in the UK. Suits of armour stand guard in the Great Hall, while the Carolean Wing houses collections of weapons, tapestries and oak furniture. The attractively maintained Victorian Garden contains sculptures and topiary and, for those with a little more energy, the property also offers canalside and woodland walks. 7ml N of Ormskirk, in village of Rufford on E side of A59. From M6 exit 27, follow signs for Rufford. Adjoins towpath of Rufford extension of Leeds-Liverpool Canal.